This chapter begins by identifying certain core conditions of the neoliberal university. Drawing on recent scholarship in the field which have viewed the neoliberal university as ‘toxic’ (Smyth in The Toxic University: Zombie Leadership, Academic Rock Stars, and Neoliberal Ideology. Palgrave MacMillan, London, 2017) and as operating a regime of ‘terror’ (Roberts in The Review of Education, Pedagogy, and Cultural Studies 35:27–43, 2013) it is argued that the manifestation of neoliberalism within universities serves to increase anxiety, precarity and fear as fundamental features of contemporary academic life and, in doing so, thereby limits relational and other-regarding virtues such as compassion, kindness and humility. Yet, at the same time, the fact that academic lives have become more anxious, precarious and fearful actually serves to increase the need for relational and other-regarding dispositions, such as compassion, in educational institutions, including universities. 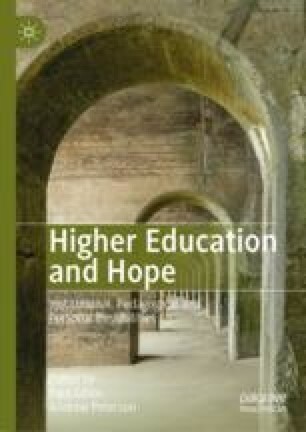 Drawing on Gravlee’s (Journal of the History of Philosophy 38(4):461–477, 2000) work on Aristotle and hope, the chapter argues that hope is needed for deliberation with others and that other-regarding virtues can provide pathways for hope in academic workplaces through their focus on relational ways of working based on mutual concern and solidarity. Cottingham, J. (2014). Hope and the Virtues. http://www.johncottingham.co.uk/resources/Hope-and-the-Virtues.pdf. Accessed October 30, 2018. The Guardian. (2015, July 7). Let UK Universities Do What They Do Best—Teaching and Research. Retrieved October 9, 2018, from https://www.theguardian.com/education/2015/jul/06/let-uk-universities-do-what-they-do-best-teaching-and-research.